It was about when Geoff Johns started his run with this series that I first heard about the lameness that was apparently Aquaman. I knew, of course, from my own childhood that he wasn't the most popular of characters, but come on, just because he wasn't Superman, Spider-Man, or Batman didn't make him uncool. Those animal talking dudes were always my favourites. Now I'm questioning whether or not DC didn't play up the whole laughable superhero thing. 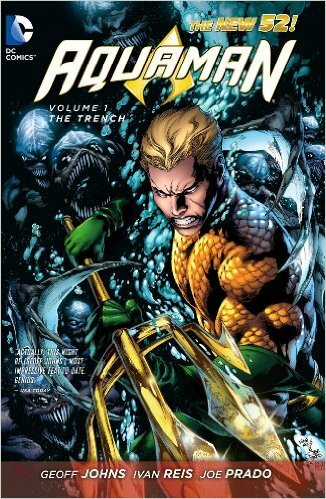 To have a comeback, you need to have something to come back from and to be sure, almost all of the humour in Aquaman: The Trench comes from how pathetic Aquaman is perceived to be. Then, lo and behold, he saves the day and he's loved again. Just as, miraculously, Johns has made us love the character again. Marketing ploy and one punchline jokes aside, the book is still great. We get characters with complexity and a plot with surprising depth and ethical thought. Basically there are monsters from the Trench who make their way to the surface world to gather humans and other animals to bring back to their society as food. It turns out they are starving and Aquaman, not unsympathetic to their needs, tries, in vain, to find a way to help. There are tough choices to be made. Reis' art is raised above generic superhero fare with his awesomely terrifying deep-ocean monsters and Arthur Curry's (aka Aquaman) flashbacks which are painted with softer watercolours, setting such scenes apart and giving them sentimental respect.